The new 2520GTA series signal generator delivers extremely fast switching speeds, high output power, and low residual phase noise in a single unit. The 2520GTA series signal generator is offered in a frequency range of 100 MHz to 20 GHz with a frequency resolution of 0.001 Hz over the entire band. Loaded with standard performance features such as high time base stability and an optional feature of high leveled output power, the 2520GTA makes an excellent test solution for a wide range of applications such as antenna and components testing. The 2520GTA offers frequency and amplitude switching speeds of < 350 μsec for any step size over its full frequency range and typically < 200 μsec for frequency steps up to 100 MHz within a band. With these industry best switching speeds, the 2520GTA will undoubtedly improve throughput and reduce the cost of testing, making it ideal for data intensive applications such as antenna characterization or high volume component testing in manufacturing environments, where test throughput must be maximized to reduce the cost of testing. The 2520GTA signal generator, with optional high output power exceeding +20 dBm to 20 GHz, eliminates the need to use an external power amplifier and makes it ideal for measurements where low harmonics and high drive conditions are required. A standard ovenized OCXO oscillator in the 2520GTA signal generator offers a high stability time base to satisfy most stringent requirements in terms of time base aging and accuracy. 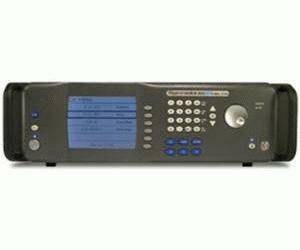 Furthermore, the 2520GTA accepts both a 10 MHz and 100 MHz external reference that automatically disconnects the internal 10 MHz OCXO reference and phase locks it with the internal 100 MHz OCXO reference. In addition, the ability to share a reference frequency between two sources at 100 MHz rather than 10 MHz leads to much greater stability (time and temperature) and lower residual phase noise performance. The 2520GTA is loaded with digital high rate sweep modes that allow the output frequency to sweep linearly between a pre-determined start and stop frequency. In addition, the 2520GTA signal generator interfaces seamlessly with the Giga-tronics 8003 Precision Scalar Analyzer for swept stimulus/response measurements such as gain, isolation, and return loss of components such as amplifiers, isolators/circulators, filters, converters etc. The 2520GTA series unit has full command compatibility with 2400 series and previous generation signal generators from Gigatronics. In addition, Giga-tronics offers optional command set for legacy signal generators offered by other manufacturers allowing customers to replace all legacy signal generators with single unit from Giga-tronics.